A Golden Age of a civilisation is not only the time that citizens of a country can acheive great things. 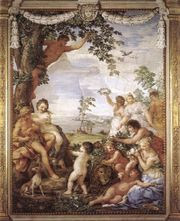 The term Golden age stems from Greek mythology. It refers to the highest stage of Greek spectrum. The features of a Golden Age are a strong military, an efficient government, stable, peaceful, full of prosperity and an open society which encourages learning. An analogous idea can be found in the religious and philosophical tradition of the Far East. For example, the Vedic or ancient Hindu culture saw history as cyclical composed of yugas with alternating Dark and Golden Ages. Similar beliefs can be found in the ancient Middle East and throughout the ancient world. There are creative people in most civilisations at most times but it is during a Golden Age that they have their best chance to flourish. During a Golden Age, citizens experience on of the best times, for trade with other countries to develop and when other advantages are found out. A Golden Age is truly a time of a civilisation not to be forgotten.